Fast and Furious, the Bobster Fat Boy sunglasses feature photochromic lens technology. The lens transmission allows 85% of light through indoors and 32% of light through while outdoors in bright light. Featuring anti-fog, polycarbonate lenses, this eyewear enables usage through varying light. 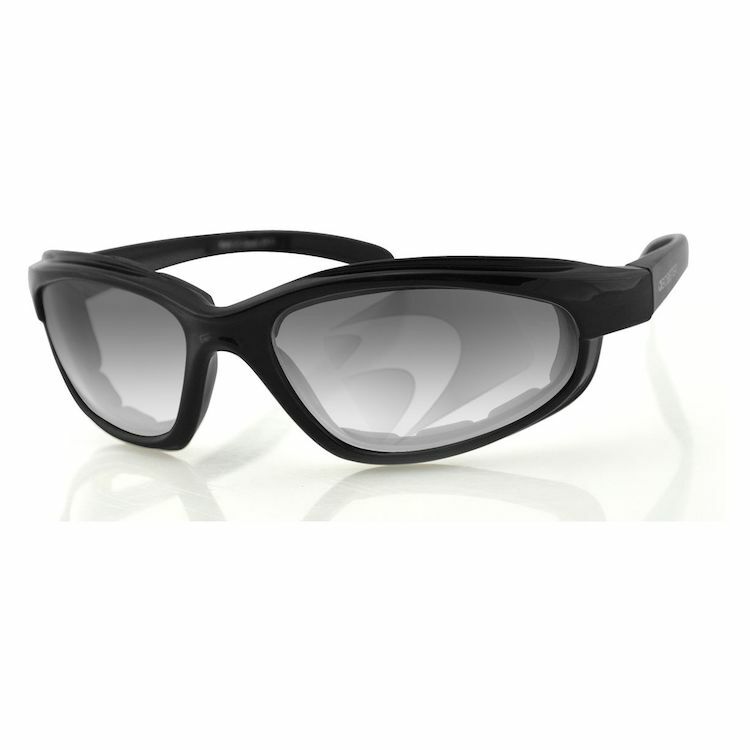 In addition, closed cell foam around the frame improves comfort and prevents wind or debris from impairing clarity. Have through the years about 4-5 pairs of HD self tinting glasses. Though they are great to start, they don't last. Course, I ride a lot and put on 10-14000 miles a season. I haven't had this for a year yet but they are simple, look great and i like the protection around the eyes better that foam or sponge. So, to close...... So far, so good. Another key note, is the price. You'll save a buck 50. These glasses look great, are large enough for peripheral vision, and act as wind blockers while still allowing a small amount of air circulation to prevent fogging. Their lenses are optically correct and the photochromic darkening is excellent. I love 'em; use them on my Harley and our Corvette convertible. Highly recommend these glasses if you like the style. They block the wind well and protect your eyes at highway speeds. However, the photochromic portion leaves a lot to be desired. These glasses do not get dark in the sun like one may think as its barely noticeable. They are cheaper than ruining an expensive pair of sunglasses so overall I definitely recommend. Good pair of glasses for the price. The glasses do a great job of protecting my eyes, they block wind and dirt and allow enough wind to keep them from fogging up. But if you're idle at a light or something they will fog and clear up as soon as you start riding. I'm sure it's unique to the individual but the glasses aren't the most comfortable fit and wearing with a full faced helmet feel a bit awkward. They do the job tho! The Bobster Fat Boy is just great! The fit is pretty good and stable and they look cool as far as sunglasses go (Even when off the bike). From the reviews before my purchase I saw that I shouldn't expect them to get dark enough to block the sun but that was ok as I needed them to block the wind since I already have a dark visor shade on my helmet to work in parallel. Checked a lot of sunglasses. These were the best for the money. Really like the photochromic lenses. Highly recommend. The glasses claim to be photochromic if they darken up it's faintly noticeable at best. I use them at night only. Photochromic is the only way to go on a motorcycle. Cloudy, early or late, the shades are light... Mid day they darken up. I have not used these glasses yet, but have some high end Rudy's that I love! purchased for a friend he wears them all the time very pleased. Do you wear them at night? How is the night time visibility? BEST ANSWER: Perfectly fine at nigh, I wear them all the time. I've had mine over a year now and still love them! Hope that helps. They are clear at night so I wear them every time we ride. Can I get these in bi-focal prescription?